I hope you are all doing well. It’s the end of March which means many things, Spring is definitely heading our way in the UK, as is Easter and of course that means Easter eggs a plenty …. and the end of the month signifies a new Clearly Besotted release! I have four days of teasers for you, starting today with a cute pop up shadow box card featuring the super sweet Dragon Plushies. 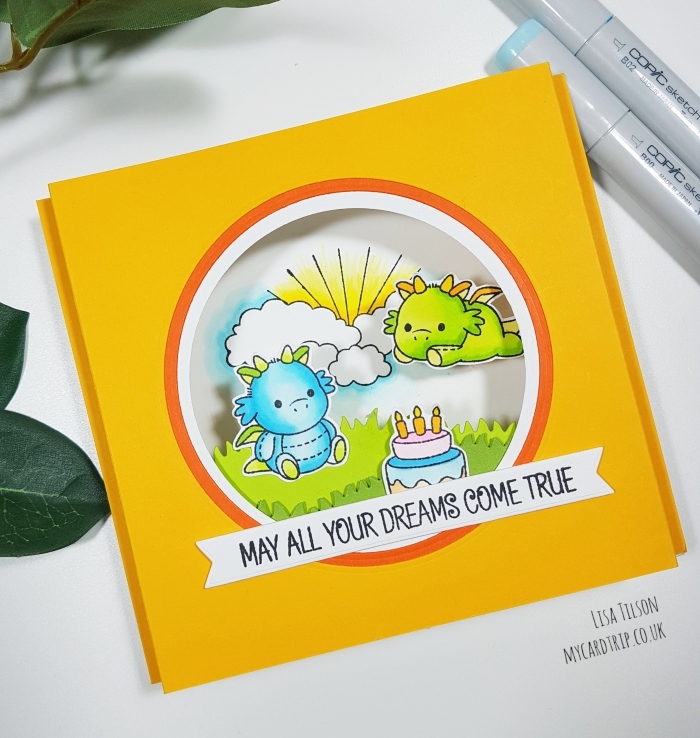 This is one of the larger A6 sets and has a whole range of adorable little dragons plus a stamp to create a sunny/cloudy sky. So here is my card for today. For this card, I followed the instructions in Jennifer McGuire’s video with an adaptation to the overall card size and I added an extra window layer. It was fun to do, not difficult at all, you just need to plan and think ahead a little. To see the card in action, click over to Instagram. I began by cutting two panels of cardstock (5″ x 7″) one Sunshine yellow and one white and I used heavy cardstock here as it is much more stable. I scored at 0.5″ and 1″ at each end on each panel. You then fold these so that they form a sort of concertina but do not glue them together yet, you need to work on the rest of the card. The main front of the card will measure 5″ x 5″ when stuck together and flattened down, so it fits easily into a square envelope. At this point I also cut a 4.5″ square panel from darker orange cardstock and one from white 80lb Neenah – these will be backed onto the front panel to provide interest and stability. To create the front panel, I took three Hero Arts Circle Infinity Dies to cut my windows, starting with the largest which I centred onto the sunshine yellow cardstock. Once die cut, I used this as a template to cut the circle in the darker orange card panel, and again to cut the window in the white panel. These were adhered together using Ranger Multi Medium Matte behind the front panel. Next I took two different green cardstocks and used the MFT Grassy Hills dies to cut them – I trimmed them to fit behind the window and adhered them together with foam tape – so there is some dimension between the two hills. This was then stuck down to the back of the window with strong DST. The front panel is finished at this point. I then worked on the back panel and stamped the cloud/sun image from Dragon Plushies with Memento ink and did some very simple Copic colouring. I didn’t want the whole back panel to be sky, so I just coloured some blue around the clouds to give the illusion of a sky. 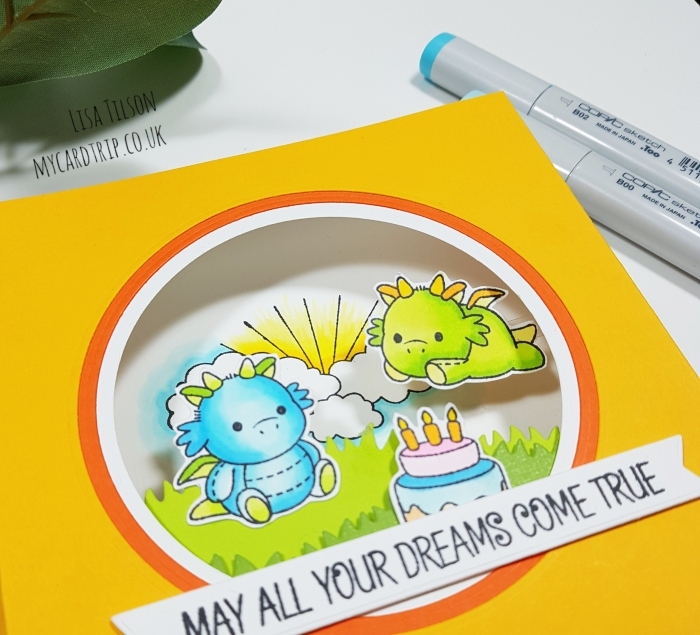 At this point, I also stamped the two dragons and the cake onto Neenah, coloured them with Copics and fussy cut them but there are coordinating dies available. (Copic numbers are listed below if you are interested). All I needed to do now was assemble the card. I glued the blue dragon and cake amongst the grass. I then added a little strip of acetate onto the back of the green dragon and this was attached with strong tape to the concertina area of the right hand side of the card. You need to make sure it is adhered into the folds of the card so that when you open and close it, the little dragon flies in and out! The sentiment from the soon to be released Say It With Banners, was stamped onto Neenah and die cut with MFT Essential Fishtail Sentiment Strips. All I needed to do at this point was use a strong adhesive tape to glue the sides together, pop the sentiment up with foam tape and the card was finished. It sounds complicated, it isn’t at all, but you need to work in stages and think ahead so that you can get everything where you need it to be before finally pulling the card together. There are so many options to create scenes with these cards and it’s fun to have something moving around too. 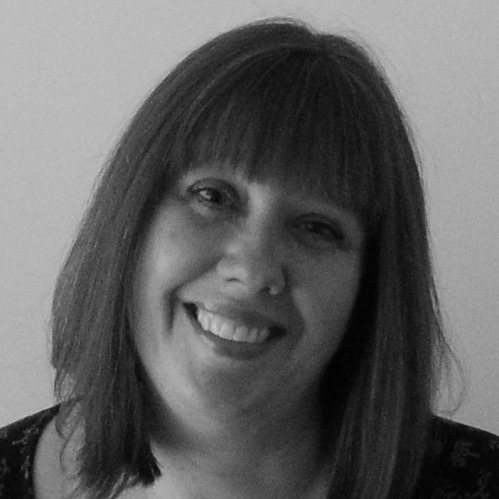 Jennifer’s video is excellent, as always, to help you. That finishes today’s teaser card for you. If you could spare a few minutes, please hop over to my friends Stephanie, Michelle and Keren to see what they are showcasing today. Thanks for your visit, I will be back tomorrow with the second teaser for you. The new sets will release on 1st April, 8pm BST at Clearly Besotted and Simon Says Stamp. oh that is just SOOOOOO adorable. now i want to watch that little green one fly in and out!! 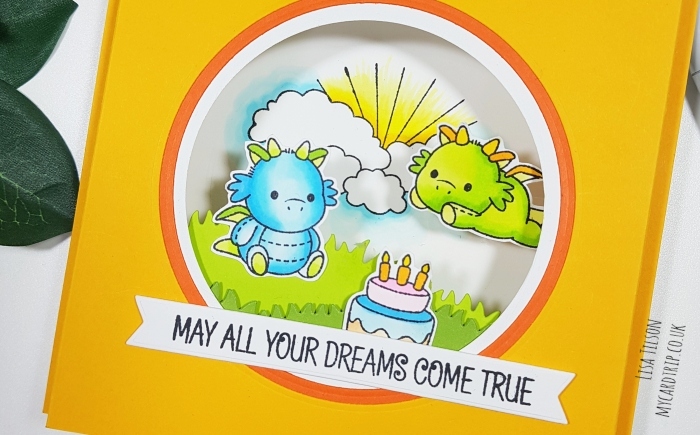 Adorable card with the Dragon Plushies! Such a cute card. That shadowbox design is so versatile.